Lurking among the northern stars of Draco there is a smudge of light, announcing the presence of a deep sky object. 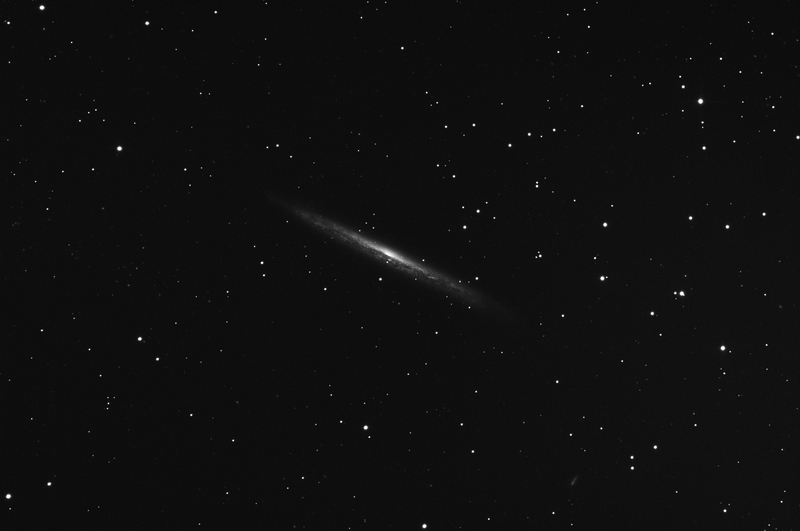 It is the wonderful NGC 5907, also known as the Knife Edge or Splinter galaxy. It is an almost perfectly edge-on spiral, located at about 50 millions of light years from us. It was discovered by W. Herschel in 1788 and it shows am anomalous low metallicity. The image above comes from the average of 15, 300-seconds exposures, remotely taken with the PlaneWave 17″ robotic unit part of the Virtual Telescope. All the images were unguided, completely trusting the Paramount ME robotic mount of the unit. The image scale is 0.8″/pixel.